Amy from Simple Kids has half a dozen ways to make the everyday special. 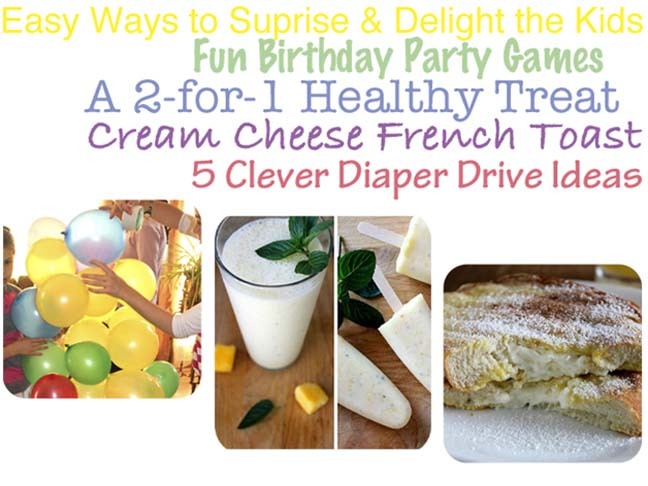 The Creative Jewish Mom challenged herself to come up with three birthday party games no one had ever heard of – how do you think she did? These tastey and healthy popsicles can be "remade" into smoothies – genius. And speaking of yummy treats, check out this decadent cream cheese french toast. Looking for an easy way to give back? Here are 5 clever diaper drive ideas. The garage sale/diaper drive is my favorite.